Sodium is an element that the body needs to work properly. Salt contains sodium. Is High Blood Pressure Affecting Your Health? The correct answer is a measurement of the force against the walls of your arteries as your heart pumps blood through your body. Your blood pressure is reported as two numbers: systolic over diastolic blood pressure. If either number is too high, there will be extra stress on your heart and blood vessels. The correct answer is none of the above. 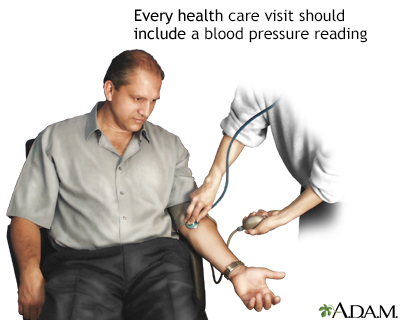 In most people, high blood pressure does not cause any symptoms. This means you may only find out about the problem when your doctor or nurse checks your blood pressure. Ask your doctor how to prevent high blood pressure. The correct answer is all of the above. Diagnosing high blood pressure early can help prevent these health problems. Get your blood pressure checked every two years if it was normal at your last reading and at least once a year if it was 120/80 or above. 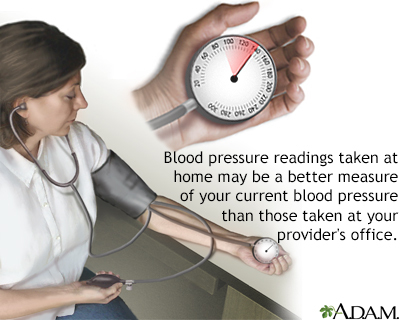 If you have high blood pressure, your doctor may ask you to check it at home. High blood pressure can cause the heart muscle to thicken. The correct answer is true. As the heart muscle works harder, it can become so thick that it doesn't get enough oxygen. This can cause chest pain and may lead to heart failure. Heart failure occurs when the heart can't pump enough blood to the rest of your body. Talk with your doctor about how to lower high blood pressure. High blood pressure can make the blood vessels wider. The correct answer is false. 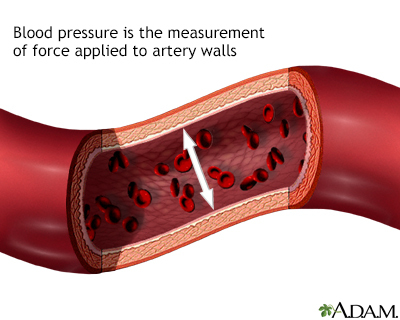 High blood pressure causes blood vessel walls to get thicker. Over time, fat and cholesterol can also build up on vessel walls. These two problems together cause blood vessels to become narrow, so blood can't flow as freely. Reduced blood flow can increase the risk of heart attack and stroke. Which is a sign of decreased blood flow? The correct answer is all of the above. 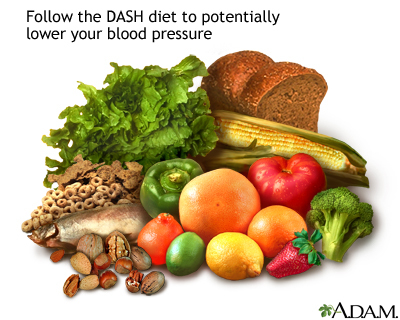 High blood pressure can raise your risk of peripheral artery disease (PAD). This is the narrowing of the vessels that carry blood to the legs and feet. PAD occurs most often in men over age 50. See your doctor if you have high blood pressure and notice any discomfort in your legs or feet. Which of the following are risk factors for stroke? The correct answer is all of the above. 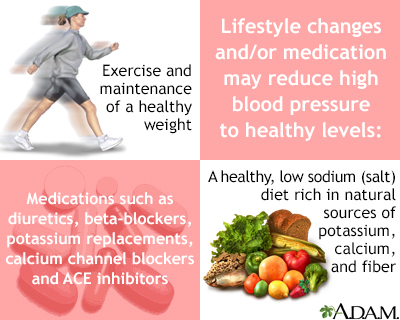 High blood pressure is the number one risk factor. A stroke occurs when a blood vessel that supplies the brain bursts or gets blocked by a blood clot. The symptoms depend on which part of the brain is affected. Ask your doctor to explain warning signs of stroke. Which is NOT a common warning sign of stroke? The correct answer is chest pain. If you notice any signs of stroke listed above, call 9-1-1 immediately. Prompt treatment can save your life. If the stroke is caused by a blood clot, a clot-busting drug may be given to dissolve the clot. For this drug to work, you must be treated 3 to 4 1/2 hours after symptoms first started. The correct answer is all of the above. High blood pressure can damage blood vessels in the retina, the part of the eye that changes images into signals the brain can read. You may not have symptoms at first. Tell your doctor right away if you notice any changes in vision. 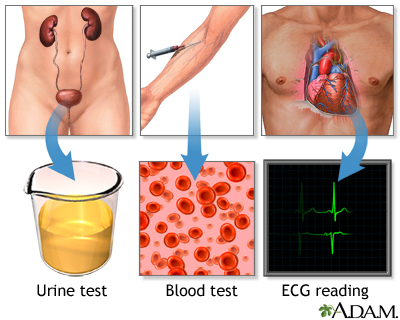 Symptoms of kidney disease appear immediately. The correct answer is false. Your kidneys remove wastes and excess water from your body. 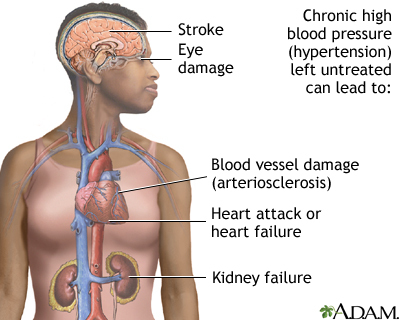 High blood pressure damages the kidneys, making it harder for them to function. Kidney disease often has no symptoms until a lot of damage has occurred. Controlling high blood pressure can protect your kidneys.